The Communist Party USA offers its most heartfelt condolences to the parents and families of the victims of the horrendous crime and tragedy which took place today at Sandy Hook School in Newtown, Connecticut. To say that 20 young children were gunned down in their elementary school as were six adults – teachers, staff and principal – is so unspeakable and heinous it boggles the minds and hearts of our members as it does all Americans. 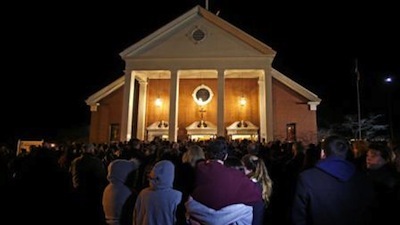 We extend condolences to the entire community of Newtown and the state of Connecticut as all begin the terrible grieving process. Our members grieve with you and offer support today and the many hard days to come. It should also be said that we recognize the incredible courage of teachers, staff, parents and the first responders, who held it together in order to usher the rest of the children to safety. As the country grapples with the politics and aftermath of Sandy Hook, let us not forget that there are some who profit from the manufacturing and peddling of assault weapons, dealing in fear and offering constitutional and political cover for the unthinkable. We will continue to work for bringing the necessary coalitions together that – through common sense and a common stance – work for a culture, government and country where such tragedies and crimes are indeed unthinkable and unheard of. Communist Party: Justice for Trayvon Martin!